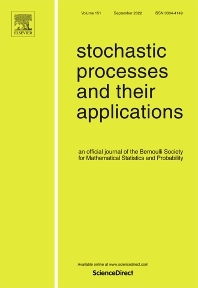 Stochastic Processes and their Applications publishes papers on the theory and applications of stochastic processes. It is concerned with concepts and techniques, and is oriented towards a broad spectrum of mathematical, scientific and engineering interests. Characterization, structural properties, inference and control of stochastic processes are covered. The journal is exacting and scholarly in its standards. Every effort is made to promote innovation, vitality, and communication between disciplines. All papers are refereed.